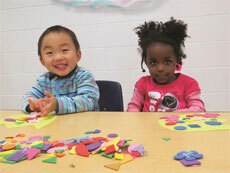 Studies show that early childhood is a key time for social and cognitive development. Eighty percent of a child’s brain is developed by the time they are three years old. During these first years of life, children develop language, social and problem-solving skills. To offer positive experiences during this crucial time of development, the Y offers Child Care and Preschool to kids ages six weeks to five years. The Y provides a safe and nurturing environment that allows kids to develop key skills at their own pace—through play-based learning and with the guidance of caring adults. All kids deserve a chance to succeed—no matter their background or family income. That’s why need-based scholarships are available to cover the cost of tuition for Child Care. Learn more. Joanna, and her two sons Israel and Kasch—see how Y Child Care helps Joanna be able to work full-time to support her family. Kathy and her granddaughter Mia—see how the Y has been a caring and consistent place for Mia in a time of transition.